Fifteen years ago (1988), Riverside International Raceway (RIR) threw the checkered flag for the last time. Long regarded as the most demanding road course track on the major racing circuits, the legendary track saw its share of race icons challenge its 9-turn, 3.2 mile track, burning many a transmission in the process. Dan Gurney, A.J. Foyt, Roger Penske, Richard Petty, Dale Earnhardt, Mario Andretti, Cale Yarborough, Al and Bobby Unser, Bill Elliot, Rick Mears, Johnny Rutherford, and Parnelli Jones -- among others -- all raced at the track. Of them, local-boy Dan Gurney practically owned the arduous course. Gurney won 5 of the 9 'Motor Trend Riverside 500' held at the track in the during the 1960s. The track held numerous races in its 31-year history, including the inaugural International Race of Champions (IROC) race in 1973. Everything from NASCAR, Indy, IMSA, and F1 to local car club races. It even housed the Jim Russell British School of Motor Racing. Sadly, all started coming to an end in the mid-1980s as the city of Moreno Valley experienced a phenomenal population boom, making the land much more valuable for development. Today, the site is home to the Moreno Valley Mall at Towngate and a host of other uses. Some of the site remains undeveloped, but the final vestige to RIR came crumbling down in 2002 with the removal of the Raceway's former marquee during construction of a Lowe's Home Improvement warehouse. However, the newly built Towngate Park Community Center -- located in the area of the former track's Turn 9 -- celebrates the raceway with various memorabilia on display. A plan to construct a permanent memorial to RIR at Towngate Park is currently in progress. 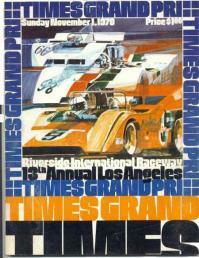 And, a complete historical accounting of Riverside International Raceway was recently published. In 1997, a new, modern oval track opened in nearby Fontana. 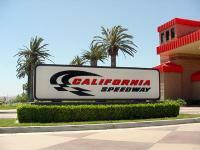 Dubbed, California Speedway, the Fontana track carries on Southern California's racing heritage. Not coincidentally, the track was built by Roger Penske and is run by Les Richter, both familiar faces at the Riverside track. So, in honor of the once world-famous RIR, a new photo gallery is now online. The gallery consists of various race program covers, a few photos of the site today, as well as an Autoweek article marking the track's closure. Last summer, the early stages of demolition began at the Riverside Plaza. This past week, the last remaining buildings -- outside of the spared Harris-Gottschalks -- were finally brought down. 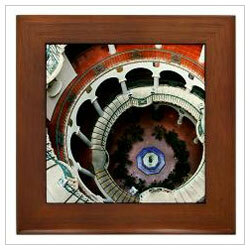 An illustrious end to Riverside's oldest "mall" which opened in 1956. Now, the real work begins to transform the site into a 500,000 sq. ft. outdoor shopping plaza -- ironically, exactly as the Plaza was prior to an add-a-roof renovation in 1984. A great photographic exhibit is currently on display at the UC Riverside/California Museum of Photography in downtown Riverside. The exhibit - Riverside in Pictures - takes a look at the changes in Riverside's landscape over the past 100+ years via historic and archival photos. Among the various works used are some black & whites from none other than Ansel Adams himself. In addition, a collection of new photos were taken of various historical places by students from the CMPs "Upward Bound" program to demonstrate the city's transformation in a "Then & Now" type juxtaposition. The exhibit runs through January 25, 2004. 2004 is the next archive.